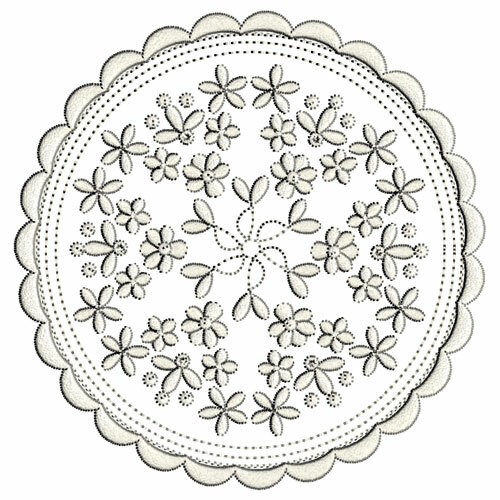 Those gorgeous embroidered bonnets that I saw at the Jane Austen’s House museum inspired me to digitise a circular design within the Jane’s White Work collection and to surround it with delicate little scallops. The design can be embroidered out on wash away stabiliser. 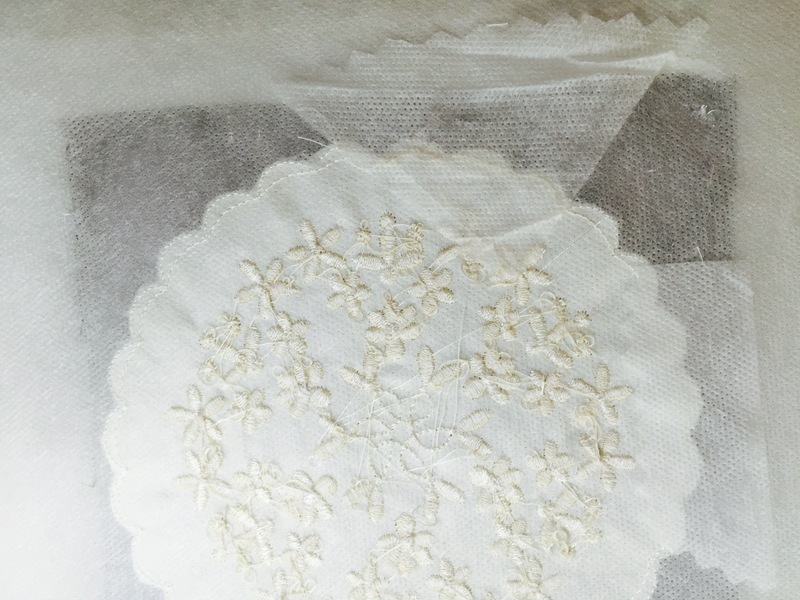 The embroidery shown is GFE-JWW60-2-15 for which I used Mettler 60 wt cotton 844 Meringue. The mat measures just under 5″. When the underlay stitches for the scallops are finished your machine will stop. Remove your hoop from the machine and carefully cut away the fabric around the design leaving the stabiliser underneath. Applique scissors are best for this with the curved blade under the fabric. I hooped my fabric and stabiliser for the embroidery which is not my usual method of hooping, preferring to just hoop the stabiliser and add the fabric with temporary adhesive spray. However I still stitched an outline around the design out of habit and this got in the way when I was trying to trim around the design. I snipped the stabiliser in several places as a result but very lightly sprayed two small pieces of stabiliser which I cut from the corners of the hooping. Turning the hoop over I pressed them over the cuts, and also pressed down on them from the right side of the embroidery to make sure they were secure. This worked perfectly. Then all you need to do is finish off the embroidery, remove it from the hoop and wash the stabiliser out. I find that an overnight soaking works best in some fabric conditioner. When the mat is dry trim away any little threads which are sticking out around the scallops. 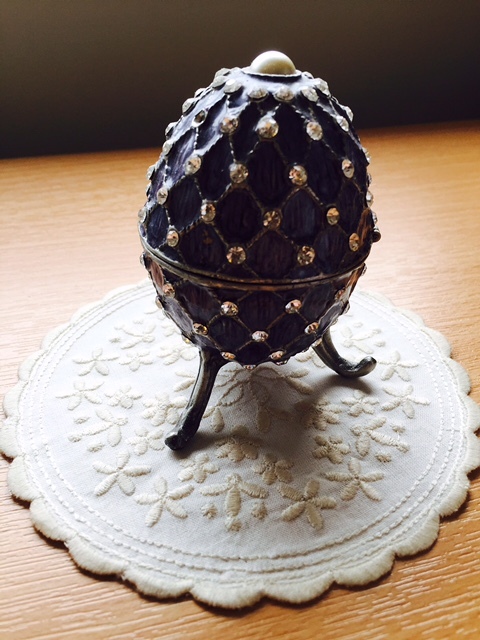 Once you have made one of these you will want to create more so I will endeavour to include some larger ones to match the large set from this collection. 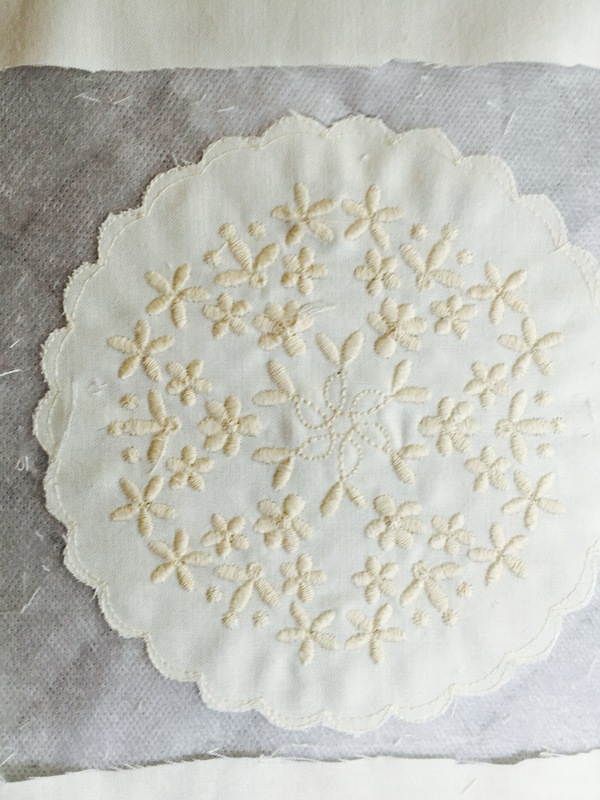 Enjoy this design and others in the Jane’s White Work collection which is being released over the next few weeks. The set that this design comes from will be released today – Jane’s White Work 2 for 5″ by 7″ hoops! 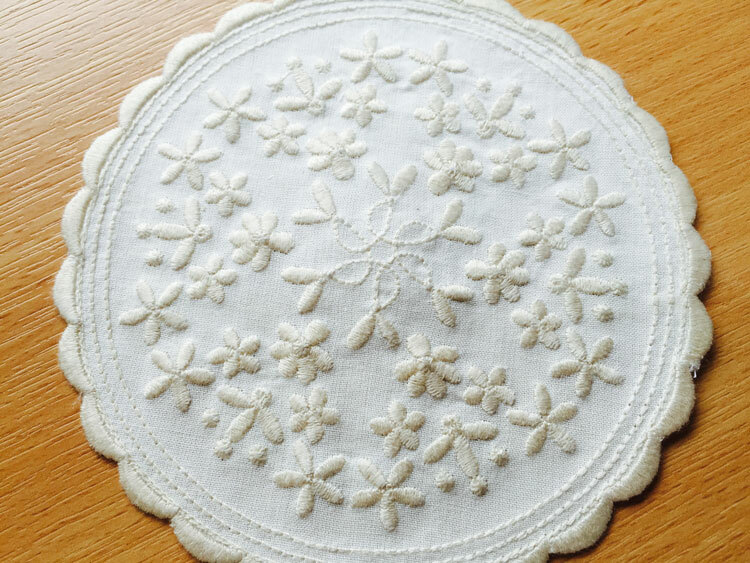 This entry was posted in Embroidery projects, New Designs and tagged machine embroidery, making scalloped edges, wash away stabiliser. Bookmark the permalink. It’s lovely Hazel….I’m looking forward to future sizes! Thank you!! !